Most of us take for granted the ease in which we get ready every morning, such as combing our hair, applying lipstick, putting on our shoes, and buttoning a jacket. Other than trying to dress appropriately for the weather or a work meeting, we don’t give our morning ritual much thought as we rush out the door. What if you could no longer dress yourself in the morning? What if you didn’t know which article of clothing to put on first? Would you feel helpless and frustrated? This is what happens to many seniors who suffer from memory loss due to Alzheimer’s or other forms of dementia. But this simple act can be empowering for an aging loved one. Here are a few tips to ease the act of dressing for your loved one with memory loss. Fewer choices. Someone with memory loss can be easily overwhelmed by too many choices. This is a good time to clean out their closets and donate what they don’t wear. Find their favorite articles of clothing that fit their lifestyle, are in good repair, free of stains, and comfortable to wear. Match clothing. To make life easier for you and for them, pick a few favorite colors that coordinate and buy separates in that color palette. This way, nothing in their wardrobe will clash. Patterns to someone with Alzheimer’s can be irritating and overwhelming. Keep their wardrobe simple with solids or subtle patterns in soft, comfortable, and easy to care for fabrics. Identical pieces. Consider buying identical versions of their favorite pieces to always have a clean version or two on hand. Easy to get on and off. It is best to avoid clothing with small buttons and difficult zippers. 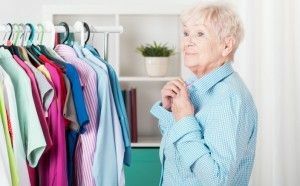 Clothing with elastic waistbands, open cardigans, snaps, large buttons, and Velcro closures are much easier for seniors to manage. Store seasonal items away when not in use. Confused seniors may put on a heavy ski coat in summer or a light dress in winter, it is easier to keep these out of sight. But keep in mind, many seniors are very sensitive to the cold even in warmer weather. They may often be chilled when you are not. Light jackets, cardigans and laying pieces are good to have on hand to keep them comfortable and warm. Give them time. Give your loved one enough time to dress and groom themselves in the morning. Try not to rush them which can cause anxiety and stress. Limit choices. Keep only a few items hanging in the closet to choose from each morning. Store additional clothing and rotate items into the closet as needed. Add a bright light to interior closets or to a wardrobe so they can easily see their options. Wire drawers. Some closet organization systems come with wire drawer options. These can be useful for seniors to easily see socks and undergarments through the mesh wire. Ascending hanging rods. The elderly with memory loss may be easily confused about the order in which to put on clothing (i.e. pants before shoes). Installing tensions rods in ascending order with undergarments first, then the shirt on the next rod and pants on the next can be very helpful for seniors to dress themselves. Adjust rods can they are the correct height to easily be reached. Multi-use wardrobe. Consider a two-part wardrobe that has daily clothing on one side and stored clothing on the other. Paint the door for the daily clothing a contrasting color that can easily be seen and the other door paint in the same color as the wardrobe or wall so it blends. Rummaging and hoarding are two common behaviors with dementia, a door that blends or locks can help to deter this behavior. Hanging hooks. Another option is to hang hooks in plain sight on the outside of the closet door or wall with favorite clothing available. Group items. Keep like items grouped together. If your loved one is still able to read, then label the drawers. Swap out pulls. It is much easier for someone with arthritis or poor agility to grasp a C-shaped pull handle than a knob. Contrasting color. Consider painting or purchasing drawer pulls in a contrasting color to the dresser. This will make the pulls more visible for someone with poor eyesight.